Twenty-seven million pieces or P8.75 billion worth of new generation currencies (NGCs) signed by President Rodrigo Roa Duterte will be available starting December 20. In a briefing, Bangko Sentral ng Pilipinas (BSP) Deputy Governor Diwa Guinigundo said 100 boxes, each with 50,000 pieces, of the P20, P50, P100, P500, and P1,000 bills will be distributed to banks nationwide. The number of P20 bills, on the other hand, was lower with only 40 boxes due to less demand for this denomination, he said. 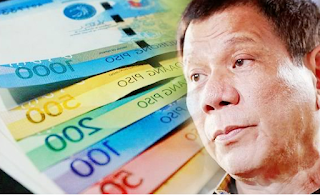 “With the change over from President (Benigno) Aquino (III) to President Duterte, the signatory to the bank note series starting this year will be President Rodrigo Roa Duterte,” he said.